This point is foundational to nearly all of the analysis of Stratechery, which is why it’s worth repeating. To understand the economics of tech companies one must understand the difference between fixed and marginal costs, and for this Amazon Go provides a perfect example. A cashier — and forgive the bloodless language for what is flesh and blood — is a marginal cost. That is, for a convenience store to sell one more item requires some amount of time on the part of a cashier, and that time costs the convenience store operator money. To sell 100 more items requires even more time — costs increase in line with revenue. Far more extensive, though, are the costs of developing the underlying systems that make Amazon Go even possible. These are R&D costs, and they are different enough from fixed costs like rent and equipment that they typically live in another place on the balance sheet entirely. If the marginal cost of selling an individual item is more than the marginal revenue gained from selling the item (i.e. it costs more to pay a cashier to sell an item than the gross profit earned from an item) then the item won’t be sold. If the monthly rent for a convenience store exceeds the monthly gross profit from the store, then the store will be closed. If the cost of renovations and equipment (in the case of small businesses, this cost is usually the monthly repayments on a loan) exceeds the net profit ex-financing, then the owner will go bankrupt. Keep in mind, most businesses start out in the red: it usually takes financing, often in the form of a loan, to buy everything necessary to even open the business in the first place; a company is not truly profitable until that financing is retired. Of course once everything is paid off a business is not entirely in the clear: physical objects like shelves or refrigeration units or lights break and wear out, and need to be replaced; until that happens, though, money can be made by utilizing what has already been paid for. This, though, is why the activity that is accounted for in R&D is so important to tech company profitability: while digital infrastructure obviously needs to be maintained, by-and-large the investment reaps dividends far longer than the purchase of any physical good. Amazon Go is a perfect example: the massive expense that went into developing the underlying system powering cashier-less purchasing does not need to be spent again; moreover, unlike shelving or refrigerators, the output of that expense can be duplicated infinitely without incurring any additional cost. It was expensive to develop mainframes, but IBM could reuse the expertise to build them and most importantly the software needed to run them; every new mainframe was more profitable than the last. It was expensive to develop Windows, but Microsoft could reuse the software on all computers; every new computer sold was pure profit. It was expensive to build Google, but search can be extended to anyone with an Internet connection; every new user was an opportunity to show more ads. It was expensive to develop iOS, but the software can be used on billions of iPhones, every one of which generates tremendous profit. It was expensive to build Facebook, but the network can scale to two billion people and counting, all of which can be shown ads. In every case a huge amount of fixed costs up front is overwhelmed by the ongoing ability to make money at scale; to put it another way, tech companies combine fixed costs with marginal revenue opportunities, such that they make more money on additional customers without any corresponding rise in costs. This is clearly the goal with Amazon Go: to build out such a complex system for a single store would be foolhardy; Amazon expects the technology to be used broadly, unlocking additional revenue opportunities without any corresponding rise in fixed costs — of developing the software, that is; each new store will still require traditional fixed costs like shelving and refrigeration. That, though, is why this idea is so uniquely Amazonian. All three companies are, at least in terms of their core businesses, pure software companies, which means the economics of their businesses align with the economics of software: massive fixed costs, and effectively zero marginal costs. And while Microsoft’s market, large though it may have been, was limited by the price of a computer, Google and Facebook, by virtue of their advertising model, are super-aggregators capable of scaling to anyone with an Internet connection. All three also benefit (or benefited) from strong network effects, both on the supply and demand side; these network effects, supercharged by the ability to scale for free, are these companies’ moats. Apple and IBM, on the other hand, are/were vertical integrators, particularly IBM. In the mainframe era the company built everything from components to operating systems to application software and sold it as a package with a long-term service agreement. By doing so all would-be competitors were foreclosed from IBM’s market; eventually, in a(n unsuccessful) bid to escape antitrust pressure, application software was opened up, but that ended up entrenching IBM further by adding on a network effect. Apple isn’t nearly as integrated as IBM was back in the 60s, but it builds both the software and the finished products on which it runs, foreclosing competitors (while gaining economies of scale from sourcing components and two-sided network effects through the App Store); Apple is also happy to partner with telecoms, which have their own network effects. In market after market the company is leveraging software to build horizontal businesses that benefit from network effects: in e-commerce, more buyers lead to more suppliers lead to more buyers. In cloud services, more tenants lead to great economies of scale, not just in terms of servers and data centers but in the leverage gained by adding ever more esoteric features that both meet market needs and create lock-in. As I wrote last year the point of buying Whole Foods was to jump start a similar dynamic in groceries. At the same time Amazon continues to vertically integrate. The company is making more and more products under its own private labels on one hand, and building out its fulfillment network on the other. The company is rapidly moving up the stack in cloud services, offering not just virtual servers but microservices that obviate the need for server management entirely. And in logistics the company has its own airplanes, trucks, and courier services, and has promised drones, with the clear goal of allowing the company to deliver products entirely on its own. In 2012 Amazon acquired Kiva Systems for $775 million, the then-second largest acquisition in company history.1 Kiva Systems built robots for fulfillment centers, and many analysts were puzzled by the purchase: Kiva Systems already had a plethora of customers, and Amazon was free to buy their robots for a whole lot less than $775 million. Both points argued against a purchase: continuing to sell to other companies removed the only plausible strategic rationale for buying the company instead of simply buying robots, but to stop selling to Kiva Systems’ existing customers would be value-destructive. It’s one thing to pay 8x revenue, as Amazon did; it’s another to cut off that revenue in the process. In fact, though, that is exactly what Amazon did. The company had no interest in sharing Kiva Systems’ robots with its competitors, leaving a gap in the market. At the same time the company ramped up its fulfillment center build-out, gobbling up all of Kiva Systems’ capacity. In other words, Amazon made the “wrong” move in the short-term for a long-term benefit: more and better fulfillment centers than any of its competitors — and spent billions of dollars doing so. This willingness to spend is what truly differentiates Amazon, and the payoffs are tremendous. I mentioned telecom companies in passing above: their economic power flows directly from massive amounts of capital spending; said power is limited by a lack of differentiation. Amazon, though, having started with a software-based horizontal model and network-based differentiation, has not only started to build out its vertical stack but has spent massive amounts of money to do so. That spending is painful in the short-term — which is why most software companies avoid it — but it provides a massive moat. That is why, contra most of the analysis I have seen, I don’t think Amazon will license out the Amazon Go technology. Make no mistake, that is exactly what a company like Google would do (and as I expect them to do with Waymo), and for good reason: the best way to get the greatest possible return on software R&D is to spread it as far and wide as possible, which means licensing. The best way to build a moat, though, is to actually put in the effort to dig it, i.e. spend the money. To that end, I suspect that in five to ten years the countries Amazon serves will be blanketed with Amazon Go stores, selling mostly Amazon products, augmented by Amazon fulfillment centers. That is the other point many are missing; yes, the Amazon Go store took pains to show that it still had plenty of workers: shelf stockers, ID checkers, and food preparers, etc. Unlike cashiers, though, none of these jobs have to actually be present in the store most of the time. 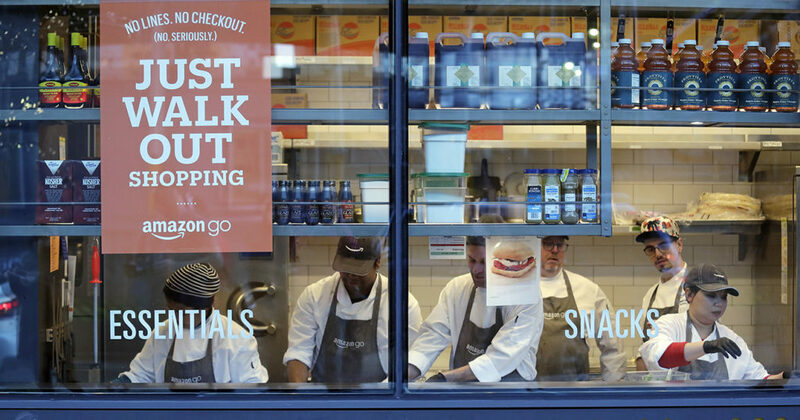 It seems obvious that Amazon Go stores of the future will rarely have employees in store at all: there will be a centralized location for food preparation and a dedicated fleet of shelf stockers. That’s the thing about Amazon: the company isn’t afraid of old-world scale. No, sandwich preparation doesn’t scale infinitely, but it does scale, particularly if you are willing to spend. The political dilemma embedded in this analysis is hardly new: Karl Marx was born 200 years ago. Technology like Amazon Go is the ultimate expression of capital: invest massive amounts of money up front in order to reap effectively free returns at scale. What has fundamentally changed, though, is the role of labor: Marx saw a world where capital subjugated labor for its own return; technologies like Amazon Go have increasingly no need for labor at all. Some, certainly, see this as a problem: what about all the cashiers? What about all the truck drivers? What about all of the other jobs that will be displaced by automation? Well, I would ask, what about the labor of Marx’s day, the factory workers borne of the industrial revolution that he thought should overthrow the bourgeoisie? I don’t seek to minimize real struggles, much less the real displacement that will come from technologies like Amazon Go writ large. For decades technology helped the industrial world work better; more and more, technology is replacing that world completely, and there will be pain. That, though, is precisely why it is worth remembering that the world is not static: to replace humans is, in the long run, to free humans to create entirely new needs and means to satisfy those needs. It’s what we do, and the faith to believe it will happen again will be the best guide in figuring out how.